The carton price on the market today must be calculated based on â€œbase paper cost + raw paper loss in production + sales price of processing cost 2 â€, among which the base paper cost accounts for about 80% of the share, and the base paper loss and processing cost account for 10% each. 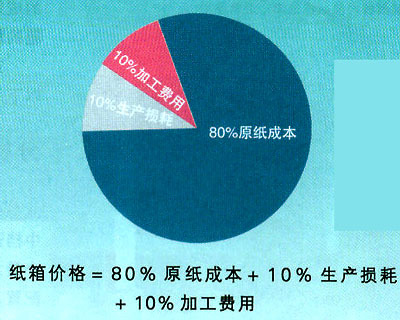 The share of the left and right, which can be seen the importance of raw paper procurement. If we are properly mastered in the purchase of raw paper, we will achieve immediate results and obtain as much profit as possible. Because the current carton profit is mainly contained in the raw paper cost and loss. The golden age of the carton industry is over. The era of low profit has already begun. The carton price on the market today must be calculated as â€œraw paper cost + raw paper loss in production + processing cost = sale priceâ€, of which the raw paper cost accounts for about 80%, and the raw paper loss and processing costs each occupy about 10%. From this we can see the importance of raw paper procurement. If we are properly mastered in the purchase of raw paper, we will certainly have an immediate effect and obtain as much profit as possible. Because the current carton profit is mainly contained in the raw paper cost and loss. Among the existing users, identify one or two of the largest businesses and determine their main business direction, which is based on high-end, mid-range, or low-grade cartons, and then determine the best base paper configuration for this and the two largest businesses. The so-called best paper configuration must be the original paper with the lowest base paper cost, the smallest variety specification, and easy procurement, on the premise of meeting the physical performance indicators proposed by users. On the basis of this determination of other business paper, as much as possible to achieve a small variety of raw paper specifications, such as pasta paper and the same paper, corrugated paper and sandwich paper consistent. In the case of a small production lot, the closer specifications are merged into one specification, for example, 1980mm and 2000mm are 2000mm, and 1930mm and 1950mm are 1950mm. In this way, the interchangeability of the base paper can be enhanced, thereby greatly reducing the number of paper change and stoppages during the operation of the tile line, reducing the number of original paper residual rolls, reducing the loss of the base paper, and reducing the management costs and storage costs of the base paper. Different carton users have different requirements for the carton. The carton factory can first design a series of carton base paper configurations according to the smallest possible raw materials. For example, the double corrugated carton is divided into D 1.4, D 2.3, and D 2.2. D-3.1 four, single corrugated cardboard boxes are divided into S-3.1 and S-2.4 two. Try to guide the carton users to include the physical performance indicators of the carton, including the color of the face paper, into the serialized base paper configuration, achieve the simplification of the variety specifications of the original paper procurement, reduce the purchase of the base paper, the specifications and quantities, or the stock of the base paper stock. Specifications and quantity. Reasonably choose the number of base paper suppliers, first, the number of base paper suppliers can not be too much, because there are very few two suppliers of the base paper in the quality and price can be exactly the same, too many base paper suppliers mean that the original paper alternative (ie The poor interchangeability increases the number of residual paper rolls, increases the loss of the base paper, increases the management costs of the base paper and storage costs, and at the same time results in unstable cartons. Second, the number of base paper suppliers should not be too small. If one or two base papers are to be produced, it will be passive, the price will be easily controlled by the other party, and the opportunity for free choice will be lost. Once the other party changes, it will cause the supply of base paper to be insufficient. Will delay normal production. The number of suppliers should be based on the overall consideration of the carton plant's business volume and liquidity. For example, if there is a large amount of business and the amount of board paper used per month reaches 1,000 tons, there should be two or three stable suppliers at the same time. If necessary, one or two back-up suppliers will be developed. For example, when there is a shortage of liquidity, if an order is placed, it will inevitably result in the inability to pay in time, the supplier will stop supplying the goods, or the cash flow will be ineffective after the payment is made. If there are two or three suppliers, the supply time will be Staggered, poor time to play, can obviously change the situation of poor cash flow.